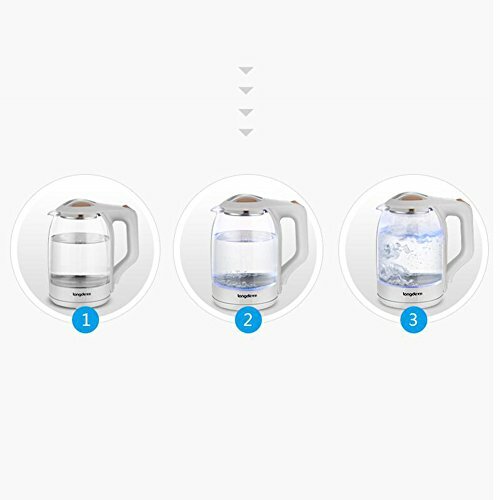 electric kettles makes it easy to boil water with attractive. The great performance features you’ll appreciate year after year. 1. Brushed stainless steel with a handle that doesn’t get hot. 2. Automatic shut off and keep warm function, that will keep the water warm for 2 hours. 1.Do not leave still water in the kettle without drying. 3. If you meet any question about the product, please contact us feel free, and we will help you to solve this question. we will give 100% service. Designed with a elegant brushed glass outer casing with,this kettle would look at home in any kitchen. After heating will become blue, after boiling will be completely blue，And then automatically power off，Temperature is stored in your temperature control. Boil water super-fast，boil one kettle ofwater only take 3-4 minute. The removable washable lime scale filter will keep your brew tasting amazing and is ideal for those living in hard water areas,High borosilicate glass material can ensure that the drinking water is safe and healthy. Suitable for both right handed and left handed users,Warning: To be used under the direct supervision of an adult.